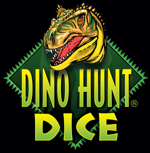 Dino Hunt Dice is now available as an App! Play solo against a computer-controlled dinosaur opponent who will do his best to heckle you and give you bad advice. Once you've had enough of his antics, or maybe just because you invited some people over, you can set up a multi-player game and pass your phone around with friends. Unlock achievements like Dino Dodger, Veggiesaurus, and Dino Mite! There's even a leaderboard where you can compete for things like highest total Dinos captured. And you're going to love this last part: it's completely free! So head on over to the app store, by which I mean take out your device and tap the screen a few times, and download the Dino Hunt Dice app!